The famous New York skyline, the Brooklyn Bridge, and the Statue of Liberty. 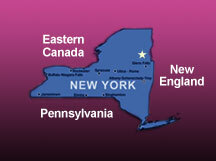 New York State has many faces and is divided into 4 distinct regions. 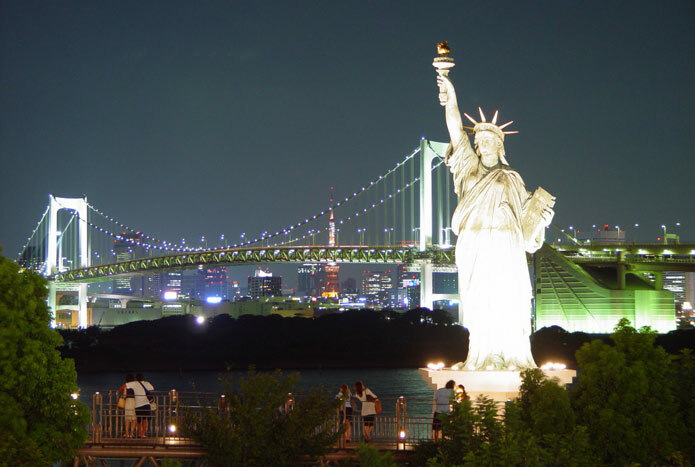 New York City is known as "The Big Apple" and "The City That Never Sleeps." welcoming immigrants and tourists from near and far, and is the starting point to the entire State of New York. Finger Lakes is distinctly wine country, beautiful rolling hills, and the Erie Canal. Underground Railroad, and other historic events. and leaders who opened up the north and west. Contact your local Tour Operators, AAA, Bus Companies, or Receptives for tours you can join. The most complete tour of New York State ever presented. >>>>> 1000 ISLANDS................................................................................................................................. Breathtaking beauty, castles galore, and ambiance second to none. the Magnificent Adirondack Mountains, oldest mountains on earth. his discovery led to innumerable escape routes on and off the water heading north to Canada and freedom. The grandest city in the world. Check out and depart for home - airports nearby, major highways everywhere. From New York City, the Underground Railroad Route split into three: East to Hartford and north thru Vermont; North to Albany, Saratoga, Glens Falls and Montreal; West to Auburn, Rochester and Niagara Falls, all with the destination of Canada and freedom. Harriet Tubman Home & Museum. insanity and single-handedly saved over 300 fleeing slaves. staunch abolishionist. Frances Miller Seward, although disliking politics, played important role as her husband’s advisor. A free-thinker, she was known as Woman of Principle and supported the Women’s Rights movement and hid runaway slaves in her basement. who fought with General Custer at Battle of Little Big Horn. see some of fascinating memoirs regarding her work with women’s rights and freedom for slaves. New Hope Free Methodist Church. Formed and operated by abolitionists. Visit church and learn about its most interesting black history. African restaurant specializing in Ethopian cuisine. the Magnificent Adirondack Mountains, the oldest mountains on earth. Hall of Fame and Museum, home to suffragette and dress reform advocate Elizabeth Smith Miller. Spend time in this quaint 1795 village and walk on historic land. Visit actual John Brown Farm and Gravesite, home and final resting place of this famous abolitionist. wife and several of his child-ren behind, returning to visit his family at Lake Placid several times. Father of Solomon Northup buried here, an interesting story onto its own. Fort House Museum, Fort Edward. Carved escape route symbols, also a wilderness road sign. Kodak Moment! Parks Bentley House, South Glens Falls. Hole which once was connected to Hudson River via escape tunnel. Southern Fried Chicken at local favorite. Travel north into nearby Vermont on historic Underground Railroad wagon route. fugitive slaves with employment and education needed to start new lives. National Historic Landmark Underground Railroad stop and one of best documented sites in nation. replica, “walk on water” as the horses did, powering the ferry that transported fleeing people. Lake Champlain into New York for journey to Lake Placid and Canada as seen in Maritime Museum. Thanks to Henry Hudson in 1609 who sailed north from New York City to Albany on the “Half Moon”, this magnificent waterway helped fleeing slaves make their incredible journey north. with some sheep, became abolishionist and activist preacher on rights of slaves, friend of President Abraham Lincoln. MacGregory Brook, a Safe House, and more. Late 17th, early 18th-century milling, farming, and trading complex, interprets daily life and culture of enslaved Africans who lived and worked on site. “Station” on Underground Railroad. NOTE: ADD a day or two to visit NIAGARA FALLS, both US and Canadian Side for sites on the Underground Railroad as this area was one of several ultimate destinations to freedom. Intro Tour of Lake George. In-depth look at Lake George - “Queen of American Lakes”, so named by Thomas Jefferson, with its extraordinary history on the beginnings of America. Prospect Mt. Scenic High & Overlooks, Lake George. of Lake George plus 100 miles and 4 states. Breathtaking. taken by combined force of British regulars and provincial troops numbering 12,000 men. British immediately began construction of "His Majesty's Fort of Crown Point,"
control under the Peace Treaty of 1783.
precipice into the Lake and died. of the British and savagery of both the French and Indians, and example of brutal primal rage. Site echoes history of three wars, French and Indian, American Revolution, War of 1812-1815.
be-tween Hudson River and Lake Champlain. First recorded military expedition 1690 by Major Gen.
using the Island during their pass-thrus. as ordered by Congress to construct fleet of 13 ships to counter expected British invasion. set stage for the Birth of Our Great Nation. Battle of Saratoga marked the turning point of the Revolutionary War. years younger when you get back on bus!!! ), race tracks, history galore. Storm relating to contributions of New York veterans. fled to Hurley, a smaller village several miles away but returned to rebuild their city stone by stone. The Purple Heart is oldest military decoration still in use and was first to honor the common soldier. orders were issued by Washington ending the eight-year War of Independence on April 19, 1783. Revolutionary War. Tour campus - security check required. A final tribute to America from the most prestigious institution in the world. added to this tour to include those sites.